Although the primary reason why adolescents and adults develop acne still remains a mystery, dermatologists researching this disfiguring skin condition now know that a combination of factors definitely contribute to the proliferation of blackheads, whiteheads and cysts on the face, chest and shoulders (classic signs of acne). Probable causes of acne outbreaks include hormonal imbalances, nutritional deficiencies, hereditary, diet, stress levels and environmental irritants such as oily lotions and high humidity. Each pore contains a follicle and an oil gland that facilitate growth of one hair. When pores remain clogged due to overactive sebaceous (oil) glands secreting too much oil, dead skin cells, bacteria and dirt quickly collect in and on the pores to produce a comedone, or blockage. These plugged pores then develop into whiteheads, blackheads or more inflamed, painful comedones called cysts that spread uncontrollably in moderate to severe acne conditions. In normal amounts, sebaceous gland oil keeps our skin (and hair) soft, supple and young looking. Composed of triglyceride oils, squalene (one of the biochemical precursors to steroids), wax esters and lipid cell metabolites, sebum is released when cells in which it is made bursts. A common, much less serious skin condition called seborrhea gets its name from sebum, which simply indicates overly greasy skin that is not affected by acne blemishes. Other benefits of sebum involve antimicrobial qualities and the ability to enrich top layers of facial skin with vitamin E. Because reduced sebum production greatly contributes to the aging of our skin, it becomes more important to keep the skin replenished with lotions and creams formulated to hydrate and rejuvenate. Contrary to popular belief, acne is not caused by eating greasy foods or chocolate. However, dermatologists think that diets high in refined sugar and carbohydrates may promote acne breakouts. High glycemic load foods such as bakery goods, soft drinks and white flour products have been found to worsen an existing case of acne. Twin studies and studies involving first-degree relatives support the notion that acne may have a genetic component that is polygenic rather than Mendelian in nature. This means that inherited acne is probably based on traits influenced by several genes instead of just one gene. Polygenic inheritance also considers the role of a person’s environment when examining why skin disorders like acne affect only certain individuals. Puberty, menstruation, pregnancy, taking oral contraceptives, menopause, andropause and endocrine disorders all have intense effects on hormone levels that can promote formation of whiteheads, blackheads and acne cysts. Androgen hormones, which are precursors to estrogens and testosterone, are known to stimulate sebaceous gland secretions when levels of the hormones increase due to physiological changes. Women who develop acne during menopause (acne climacterica) are probably suffering from the effects of reduced progesterone and estradiol production. Consequently, testosterone is then able to exert its acnegenic properties on some menopausal women. Normally, Propionibacterium acnes live on the skin and harmlessly feeds on its primary nutrient-sebum. When sebum secretions increase, especially during adolescence, this naturally promotes uncontrollable growth of these particular bacteria. Acne-prone people tend to have excessive amounts of Propionibacterium acnes in follicles, a condition that elicits a response from the immune system which sends white blood cells directly to pores. Infection-fighting white cells release enzymes that inflame follicle walls and permit sebum oil and debris to infiltrate the dermis. As a result of inflammation exacerbated by bacterial infection, nodules, papules and pustules erupt on the skin, creating the tell-tale signs of acne. The most common form of acne is clinically referred to as acne vulgaris. Non-inflammatory lesions seen in cases of acne vulgaris include whiteheads, blackheads and cysts. Lesions considered inflammatory and infectious are small red bumps called papules; pustules and large, dark red lumps called nodules. In determining the severity of a patient’s acne, dermatologists often use a grading scale that involves counting the number of cysts, pimples and nodules in the acne-covered area. Cystic acne is the most severe type of acne, primarily composed of large, pus-filled, highly visible cysts that develop underneath the skin. Cysts emerge when follicle walls are damaged to the point of splitting. The deeper the break in the wall, the larger the cyst grows and spreads. Painful and embarrassing, cystic acne can seriously damage skin tissue and inflict deep psychological wounds. Treatment needs to be aggressive and ongoing, with an emphasis on reducing sebum production, eating healthier foods and adjusting hormonal imbalances if necessary. Although scarring can occur in mild to moderate acne, it is usually inevitable when cystic acne affects the skin. Acne scars are categorized as being “icepick” scars (narrow and deep); “boxcar” scars (resembling marks left by chickenpox); “rolling” scars (wavy and shallow); and hypertrophic scars (raised above the skin’s surface). Scars represent a wound attempting to heal itself as quickly as possible by absorbing excess amounts of collagen. Too much collagen collected in one area discolors and distorts the molecular architecture of the skin. Photodynamic Therapy (commonly referred to as PDT) effectively reduces the inflammation, redness and proliferation of painful blemishes associated with acne by targeting unhealthy areas with strong wavelengths of light. Absorbed by tissues that utilize its energy to help heal injured skin by eradicating bacteria, this light therapy will also improve rosacea and greatly improve skin tone. Comfortable, safe and painless, photodynamic therapy is accompanied by topical applications of anesthesia and 5-ALA, a solution that enhances the ability of light wavelengths to heal skin conditions. Patients can resume work or other activities immediately following a PDT session. Most patients have one session every two or three weeks. For mild to moderate acne, glycolic peels, Beta peels, Jessner’s and TCA can reduce acne eruptions, even skin tone, shrink large pores and also help smooth wrinkles. Facial peels are effective at removing dead skin cells, dirt accumulated in pores and excess oil, all factors contributing to blemished, dull and unhealthy looking skin. 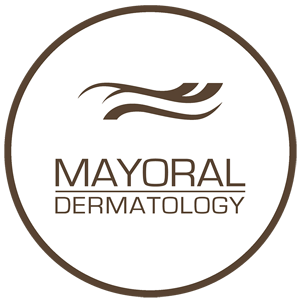 Our experienced dermatologists at Mayoral Dermatology understand the physical and psychological pain caused by acne and will endeavor to develop a successful treatment plan designed to treat your specific kind of acne. With clearer skin, you will begin feeling less self-conscious, more confident and enjoy the natural, genuine beauty of healthy skin.